[New for 2011, tweaked at somepoint] With Klondike not having launched any new products this year to review (but having fun tormenting Alfonso Ribeiro, Tiffany, and Rowdy Roddy Piper), it looks like we're going to have to review some stuff we've overlooked instead. reminds me of the "now with more caramel" on the pretzel klondike bars. did these things get smaller? whoa, seriously, these look tiny. I take a few bites and I'm not really noticing any chips, but the overall flavor is decent. I'm surprised that I'm not really sensing that typical klondike chocolate flavoring. Granted it's dark chocolate instead of their regular chocolate, but I always look forward to that unique flavor that makes klondike different from everyone else. I take some more bites and these make me miss the york ice cream bars, not that these are bad, especially when on sales for $2.50. I just expected something a little more unique. Granted the chocolate is darker than on the York version, but I wanted a pop. Still, it's good, I've got a mouth full of mint, it's just typical. 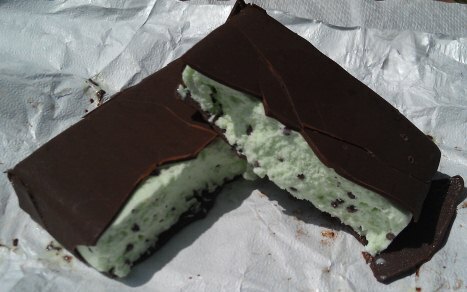 To state the obvious, and to harp on the shell a bit more, I guess typical klondike coating doesn't pair well with the mint, though the dark chocolate itself is fine, it's just normal. 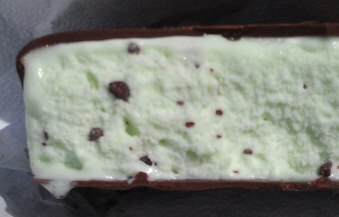 Iunno, it's just a mint ice cream bar, nothing radical. If you dig the klondike form factor, this is your treat. 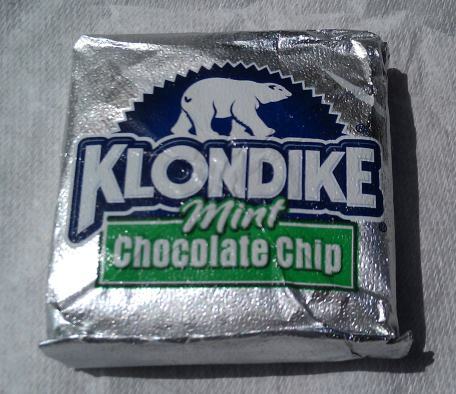 If you want that klondike flavor, I haven't noticed it yet. Finished. Did I mention the chips are totally pointless? These "better" chips are still tiny and add nothing. I'm just too busy crunching the shell to notice them. It's one of those things where Klondike just opens themselves up to be mocked for not really trying... well, they tried a little at least. On Second Scoop: I was babbling a bit yesterday, but my point is that these are a decent treat. While it's not the typical klondike chocolate flavor, it still has that same brittle and crunchy exterior that we've all come to love. It's a candy oriented dark chocolate, so not real dark or bitter or anything like that. The ice cream inside is fine as well, nothing stellar, but not a let down either. It delivers what you expect, so I can only argue so much. They are definitely smaller than they used to be! 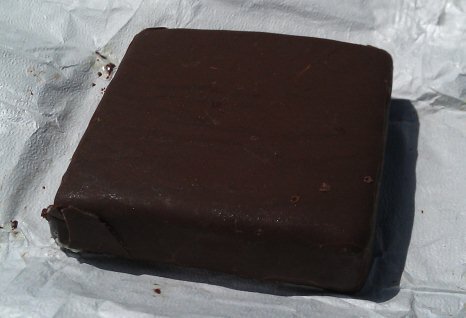 I'm probably the only one who doesn't mind the smaller Klondike size... the old ones were just a little too big for me! HA! Fair enough! They are still a decent size treat, though it does mess with the ice cream to chocolate ratio that I vaguely remember from my childhood. I thought you posted one of those Klondike candies at first as a joke. I remember having these last month some time, first Klondike I've had in quite a while. They were OK but I'd much rather just get a tub of Lady Liberty mint if I'm in the mood for mint and chocolate goodness. Definitely thinner bars. I had these when they were first introduced and they were way thicker then. Now it's getting to be like an ice cream wafer.